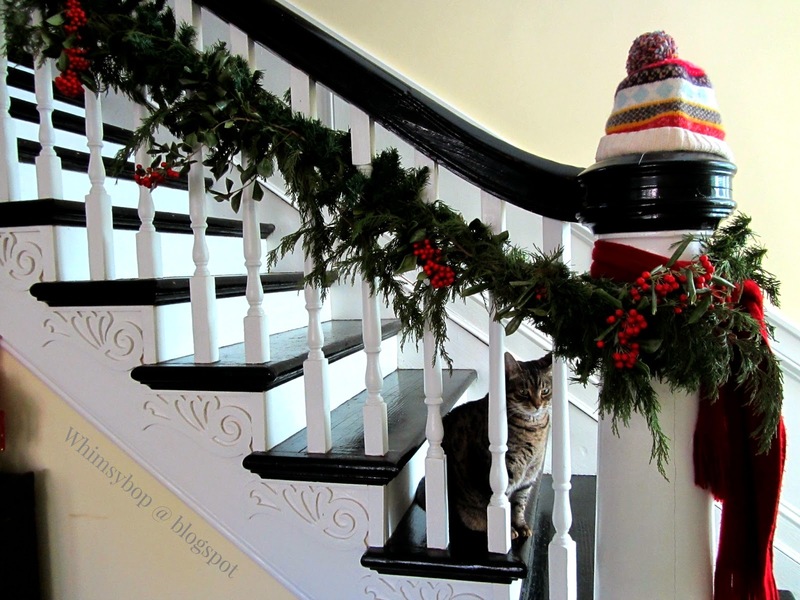 Whimsybop: Welcome to our House at Christmas! Welcome to our House at Christmas! 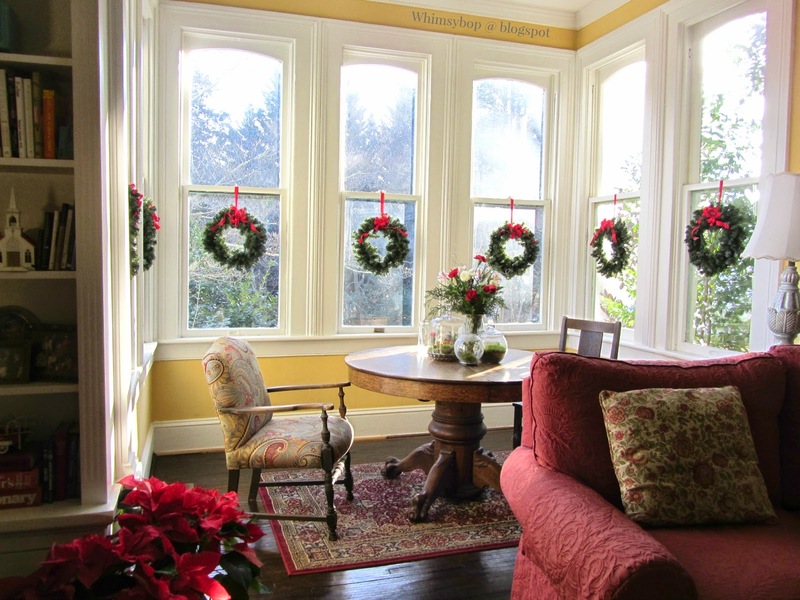 I've finally finished decking the halls and am ready to start my Christmas baking. 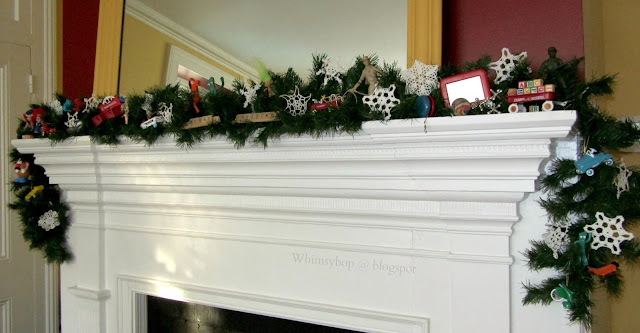 Before I grab my apron I thought I'd take you on a tour of the house and show you some of my favorite Christmas collections that I get to enjoy one month out of the year. Call me crazy but I have a habit of buying EVERY old pair of ice skates that I come across during the year - I just can't help myself! Old ice skates remind me of my childhood days in Ohio, skating on our family pond with my three siblings. My skating really wasn't THAT great but the experience was truly wonderful and so are the memories. 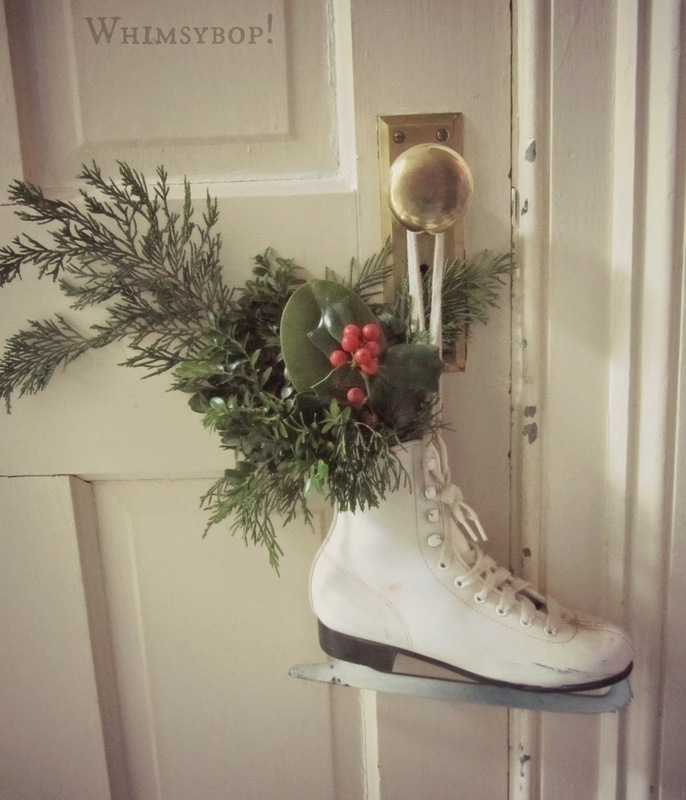 I put a little jar inside each skate and fill with greenery from our yard. If you know me well, then you know that I am attracted to all things quirky and red - which puts Santa at the top of the list! I'm drawn to Christmas snow globes, kitchy ceramic reindeer and chubby Santa dolls (and anything else). I get so excited when I find a good treasure at a yard sale or thrift store - it's Christmas in July baby! My sweet friend Joan surprised me with these two beautiful barrister bookcases when she moved from her historic home and into a condo. 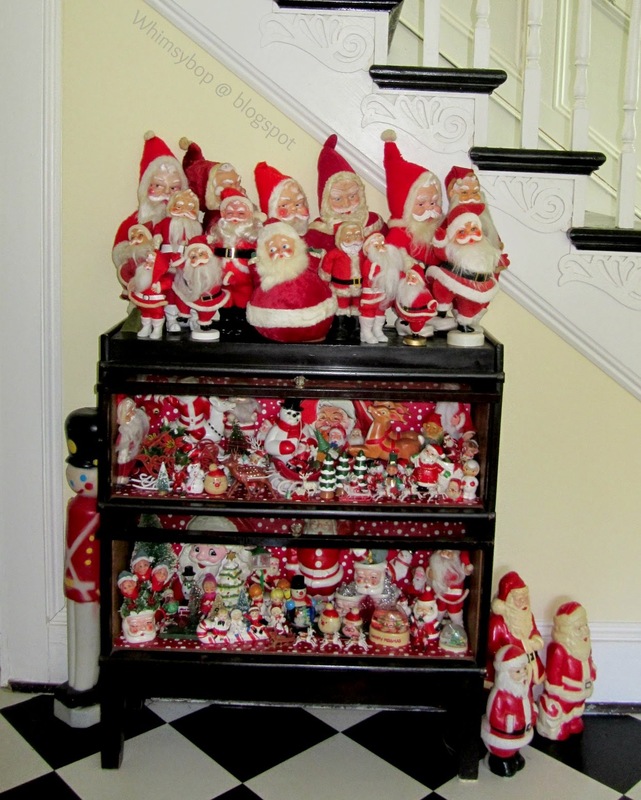 They make a perfect display for my collection of vintage Christmas. I've been collecting these Christmas elves for about fifteen years, scouring thrift shops, flea markets and church rummage sales. Finding one today is like finding a needle in a haystack now that the popular "Elf on a shelf" has taken America by storm (don't you wish you came up with THAT great idea!). 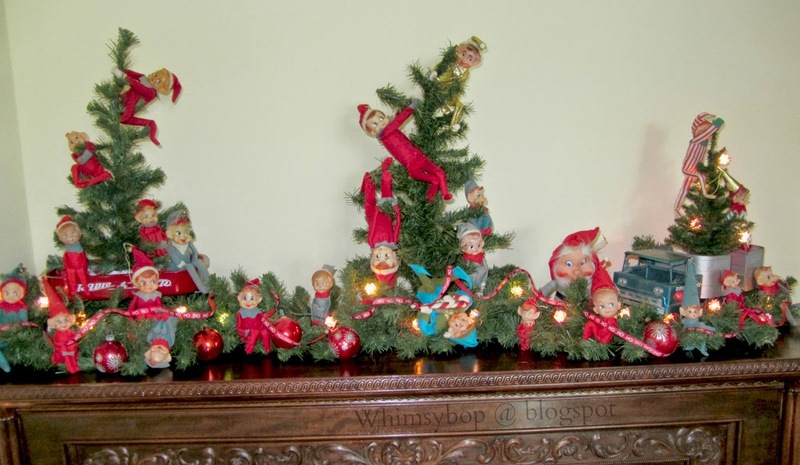 These playful pixies sit in the main foyer atop the piano and welcome guests into our home. Now we're in the living room, also known as the "library" since that's what the former owners called it. The rear of the room is my favorite spot, I just love these old windows (although they are very drafty). When it snows it looks as if you're looking into a winter snow globe - absolutely spectacular! During the winter months our family sits around this table (bundled up with blankets and sipping something hot) and putting a jigsaw puzzle together. 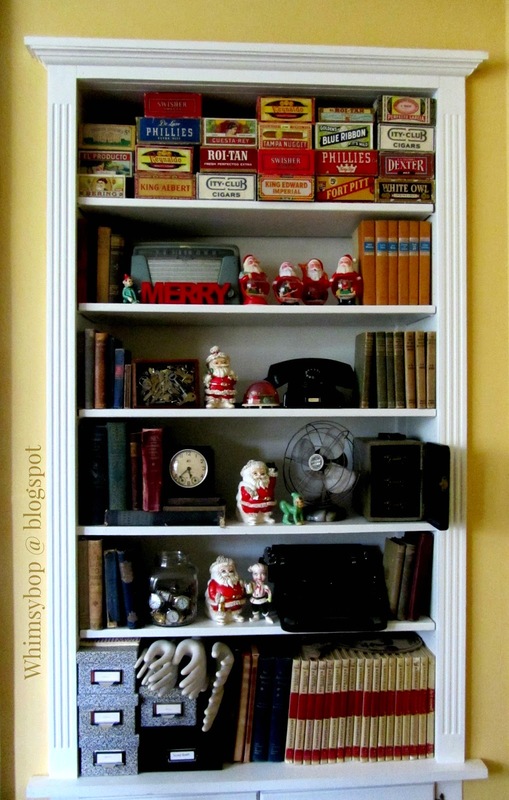 The room has four built-in bookshelves which are fun to fill with goofy & colorful things so the room doesn't feel so formal and stuffy. I've been collecting vintage snow globes for many years and enjoy showing them off here (trust me, there are many more scattered around the house). 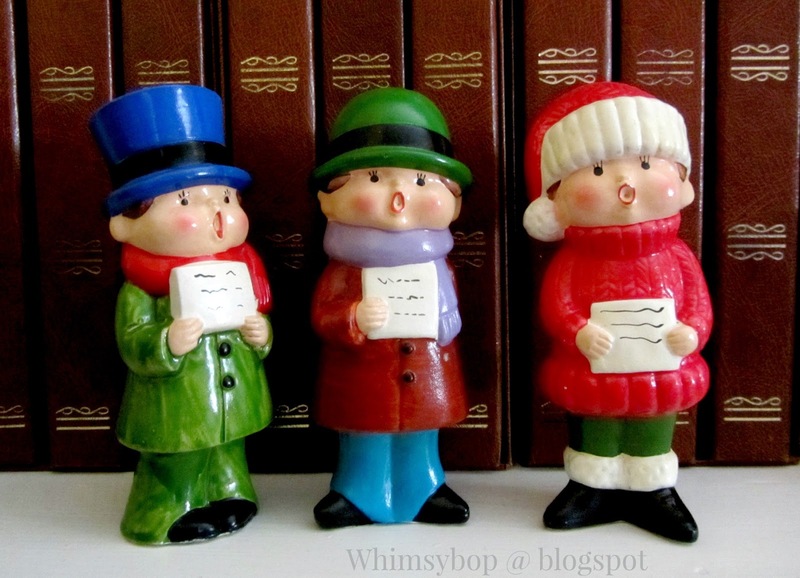 These silly ceramic Santa's (try saying THAT ten times fast) are my newest collection! These choir boys (and girls) are a fairly new collection as well. They are such fun in their bright colors and are fairly easy to find at the antique shops in town (like Bell Treasures, which is my favorite!). I love these funky plastic churches too - are they great, or what? I'm a huge fan of Poinsettias - the challenge for me is keeping them alive until Christmas and then when it's time to throw them out I am riddled with guilt, (I'm usually sick of them by February). 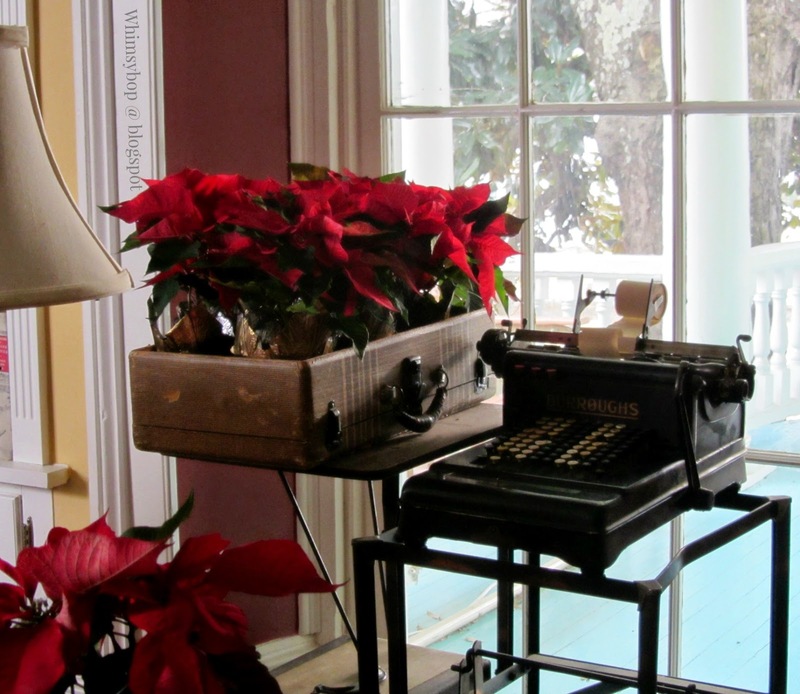 This year I put a few small Poinsettia pots in an old suitcase next to the old adding machine that my husband and I picked up on a trip this past summer - I just love it! The bamboo birdcage was given to me by my friend Paula from church. I filled it with my collection of "Shiny Brite" vintage bulbs and it is now one of my favorite displays in the living room. 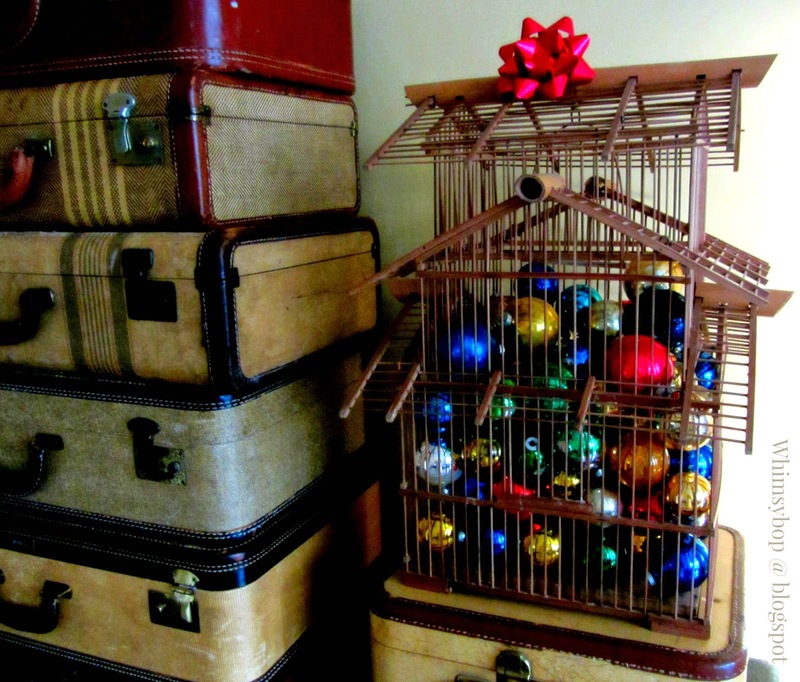 I love it perched on top of my stack of old suitcases. In 2001 our family was stationed overseas and we bought a live tree on the first Saturday in December. By the end of the week we lost so many needles that we decided to buy another tree, except there were no more live trees available on base. We went to the PX and purchased a 6ft artificial tree, brought it home and gave it a boost by putting it inside the little red wagon - and thus a tradition was born! When we moved into our present home the thought crossed our minds to buy a larger tree but we haven't the heart to give up our little tree in the Radio Flyer, which I think is pretty adorable, don't you? There are seven fireplaces in this old house, although we haven't tried using any of them since moving in five years ago. I fill them with candles and the fresh holly, magnolia and pine boughs from the yard. The mantle in the living room is filled with classic childhood toys such as Etch-A-Sketch, Mr. Potato Head, Barbie, Gumby & Pokey, Raggedy & Andy, and other of my personal favorites. Die cast ornaments replicating vintage peddle cars from my Hallmark Kiddie Car collection are also part of the fun! The dining room is where all things bright and shiny are on display - especially now that I've recently painted my dining room chairs PINK! I just bought this white Christmas tree at a thrift shop this past summer - now I need to find it's twin so I can have a matching one on the other side of the window. 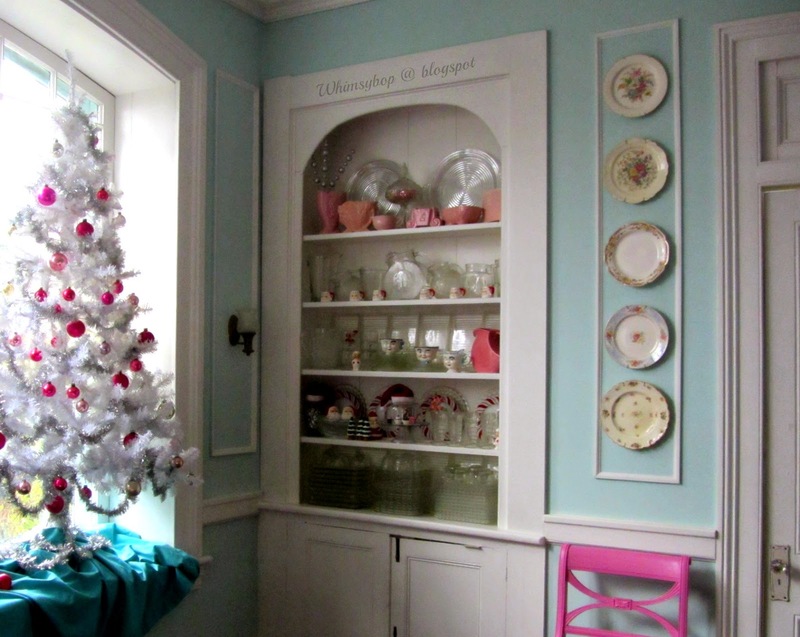 My favorite room in the house is the kitchen, probably because that is where you will find LOTS of color - especially at Christmas time! My red Formica kitchen table and green celery walls make the kitchen look festive throughout the entire year. 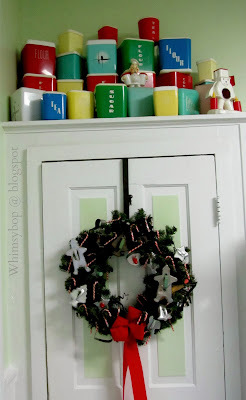 I display my collection of vintage cookie cutters on a small tree on the window sill or on a wreath hanging on the pantry door (this year the wreath won). 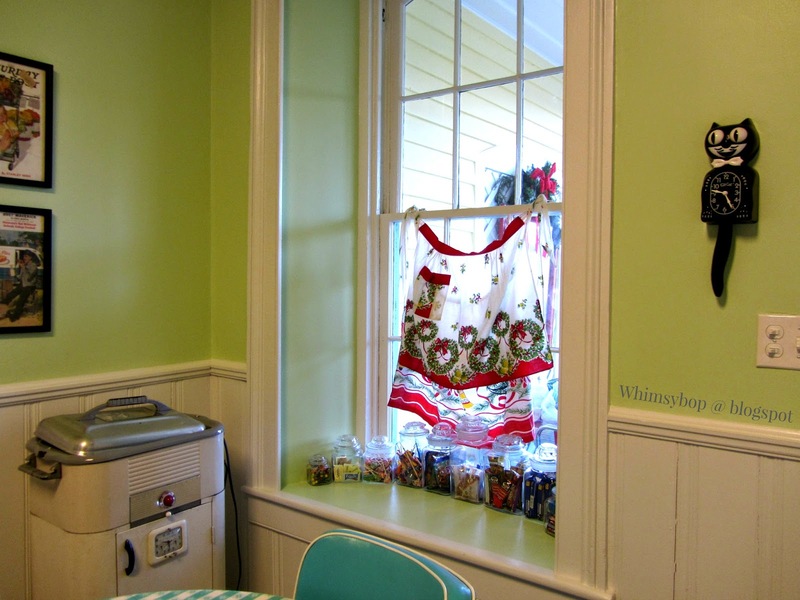 I also love to display my old Christmas aprons in the window as curtains - be aware that direct sunlight will make the colors fade and weaken the fabric. 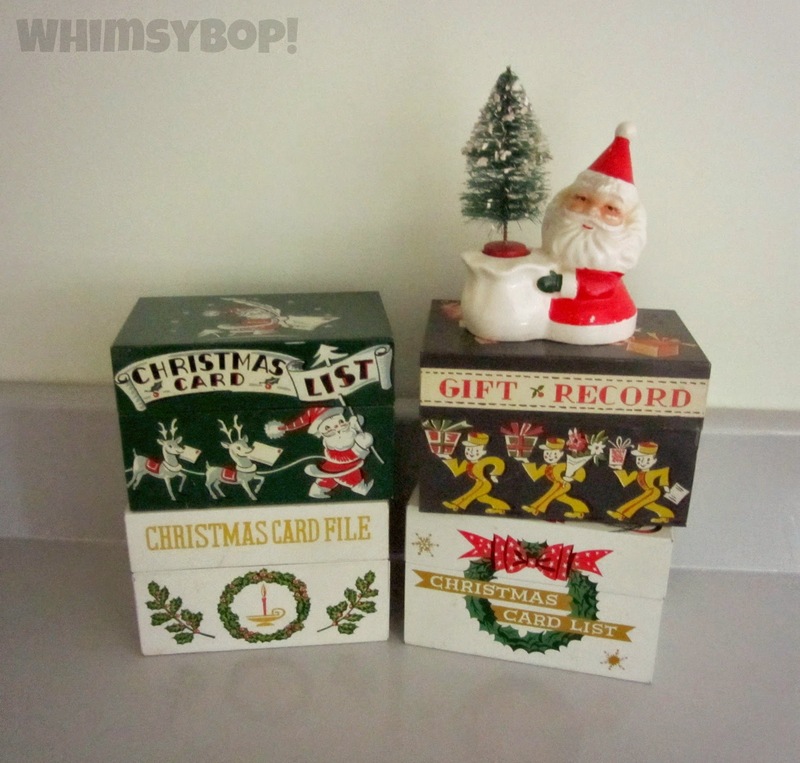 My collection of old tin Christmas boxes is fairly new (which explains why there are only four pictured here). They are made by Ohio Art and are the same size as a typical recipe box. I keep Christmas recipes, gift receipts and lists that keep me sane during the holidays. The biggest challenge is finding these old boxes in good shape - and when I do find one, I am giddy like a school girl! 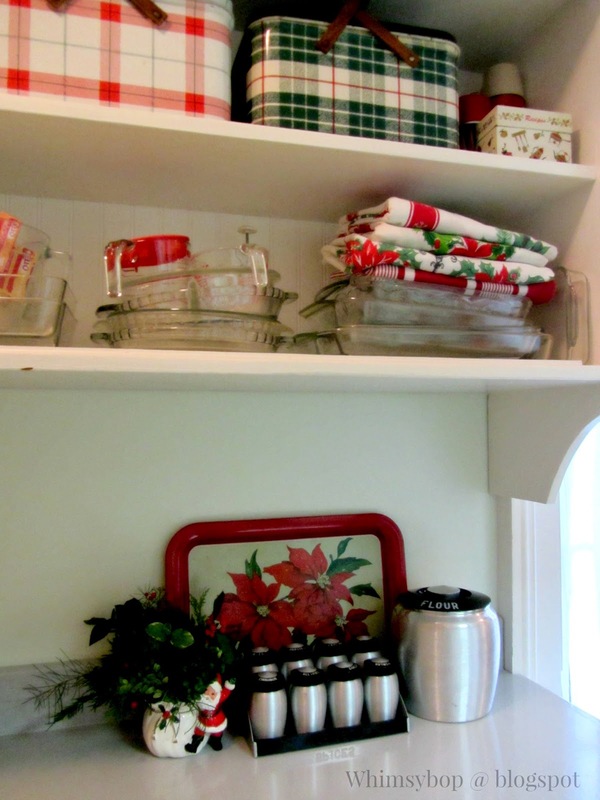 The butler's pantry (which my dear husband recently remodeled for me) is a perfect place to display red & green plaid picnic baskets, vintage tablecloths and other fun things that I love. 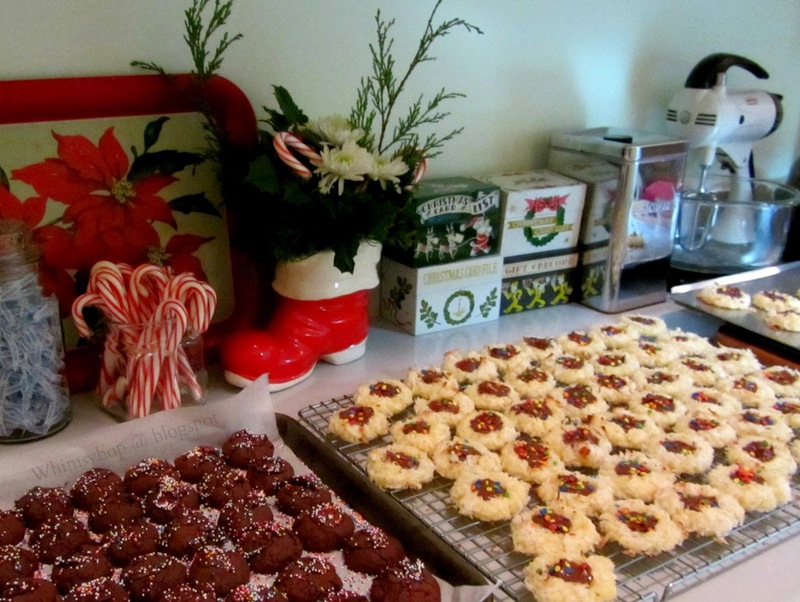 It is also my baking spot where the cookie sprinkles run wild! 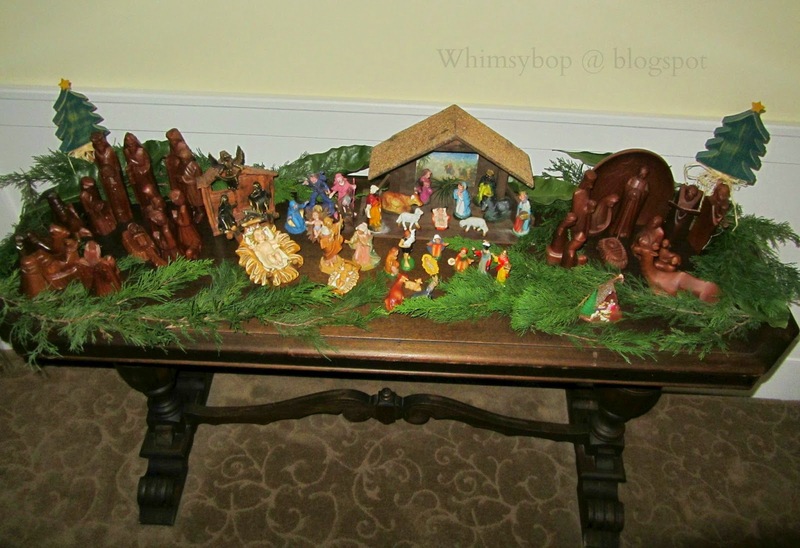 I keep the upstairs hall simple with this single table which displays my collection of nativity sets. For the longest time I only had one nativity set, the wooden one on the right that I purchased 26 years ago when I was in the Navy stationed in the Philippines. 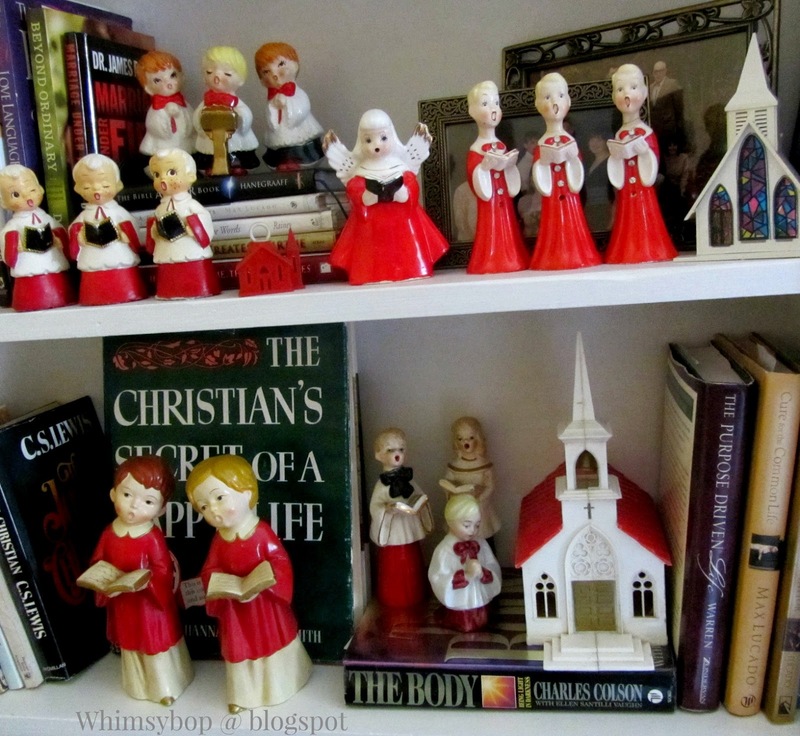 Recently I started finding little plastic nativity sets in thrift shops from the 1950's & 60's and just love collecting them! This concludes our Christmas tour - don't forget to take a cookie with you as you leave and please tell your friends about Whimsybop! Wishing you and your family a very Merry Christmas full of God's abundant blessings! Joy to the World - The Lord has come! WOW! Your home is fabulous! My favorites are the ice skate and the birdcage. I apologize for having to moderate comments, but I've been getting enough spam messages I've had no choice. Please don't let that keep you from sharing your thoughts! I was bitten by the Collecting Bug when I decided that my kitchen needed a big yellow bowl like Grandma used to have. After about six years of scouring flea markets, antique malls and thrift shops, I finally found the Pyrex nesting bowl that I was looking for! It was during my quest that I realized how much I LOVED the thrill of the hunt! 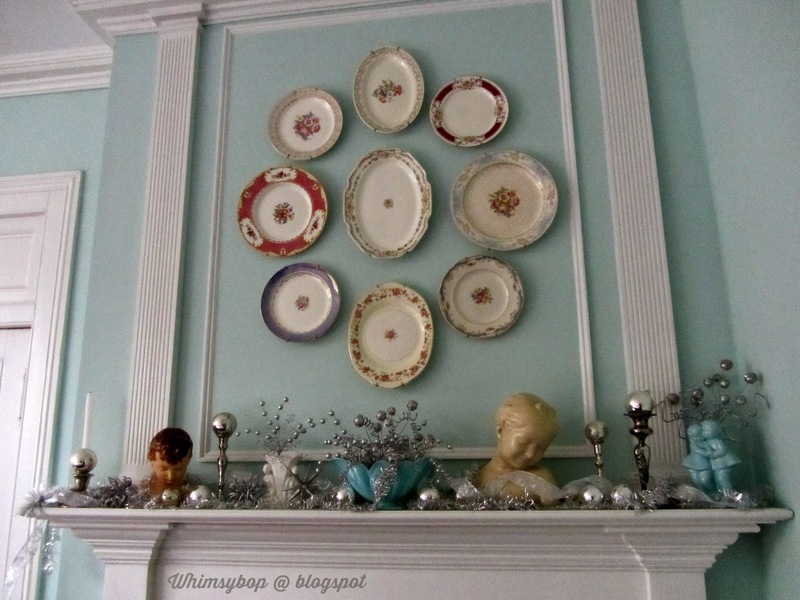 I find great pleasure in rescuing forgotten treasures and giving them new life again by using and displaying them in my home. 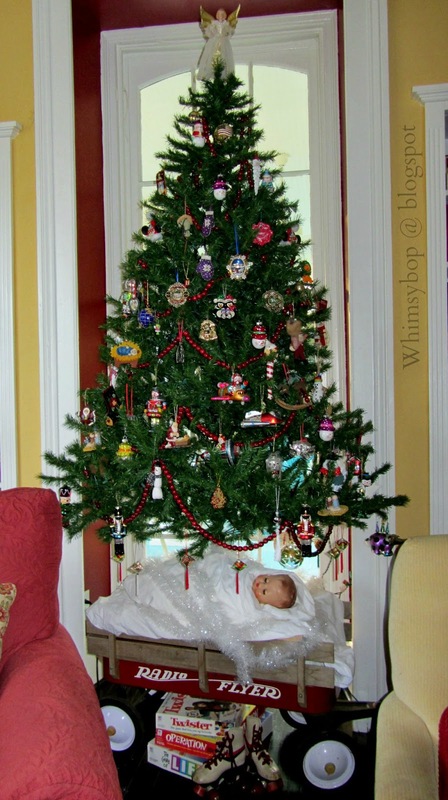 My hope is that Whimsybop will awaken the inner collector in you and will inspire you to display and decorate with your own treasures - enjoy the hunt! Click on the heart to see my doodle art to color!